look and see if I'll be coming to a city near you...dates & details will be out this week! So check back here....ALSO, I HAVE an AWESOME POST that's coming up next, SO CHECK BACK LATER TODAY!!!!! 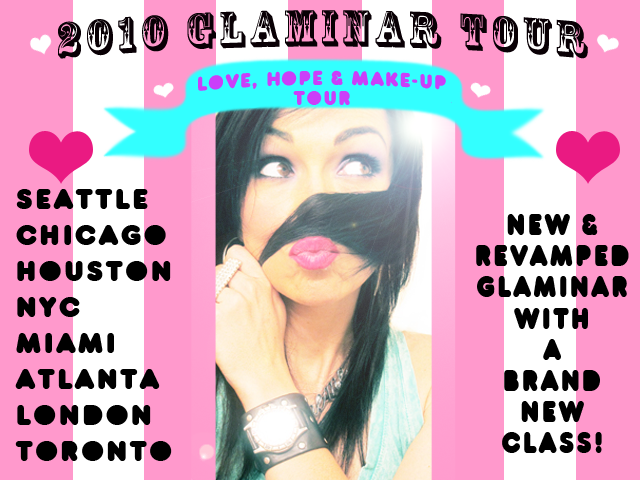 These new GLAMINARS...are going to be new, improved, and more powerfully life changing...I'm even adding a new "class"...that I hope everyone will attend, even bring your mom, sister, friends, boyfriends....everyone to the new class...it's more than make-up, it will be life and heart changing! u need to come to germany!!! I will definitely be at the Chicago one! When will the official dates be up to sign up? Please please come to Germany next time!!! OMG OMG OMG OMG YAYYYY NYC!!!!!!!!!!!!! You should come to Mexico!! Please!! Ur not coming to where I live. Oh well, hope you have fun and hopefully you will inspire more and more people at Glaminar! Yay! you are coming to toronto!!! Hey Kandee! Are you going to make Honolulu one of your stops at some point? :D I can think of several of my friends who would probably join me if you did! OMG YOUR COMING TO LONDON??? I WILL BE THERE FOR SUREEE!!!!! THANK YOU SO MUCH KANDEE!!!! AHHHHHHHHHHHHHHHHHHHHHH!!!!!! I CANT BELIEVE ITT!! I can't even believe you're coming to Canada!!! 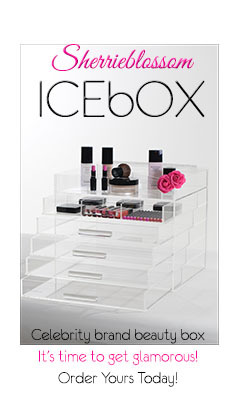 It would be lovely if it was around the same time as IMATS Toronto!!! Yay!!! You're coming to Texas!!! Kandee your coming to London I am so excited!!!!!!!!!!!! I actually can't believe it! is there any chance of coming to any other country in Europe? I see that there's London on your list, but I'm from Croatia, a small country near Italy and going to London is too expensive for me. So please take into consideration some others countries in Europe as well, because we adore you here as well. The people who get to go to these glaminars are so lucky. I REALLY hope you come to NYC!!!!!! I hope you someday come to stockholm. Kandee, Please come to PHX soon!!! Im a mommy and travel is super difficult for me, but if you came, I wouldnt miss it for the world! Also, PLEASE tell me what your nail polish is! Yay for coming to Canada!!! Any chance you could hit up Western Canada sometime?? Maybe Calgary!!! Hope so :)I live in Munich but will definitely fly to London to see you! YAY Atlanta!!!! I started calling my girls as soon as I saw our city on your list. Yay for my hometown of Toronto!! But double YAY for my current town of Atlanta!!!!! Is that London, England or London, Ontario? Come to Yuma, AZ please. I'm dying to meet you.And i don't have a car so i cant drive to those places. so please come to Yuma. OMG YOU'RE COMING TO CHICAGO!!!!! THIS MADE MY DAY!!!! i'm seriously speechless because i'm filled with so much joy and excitement!!!! I live in Chicago but I go to school in the south so I'm assuming I'll have to come home the weekend you're having the glaminar... please say it is on the weekend because I have been waiting so long for this! I never thought you were going to come to Chicago....I can't wait!!! i LOVE YOU SO MUCH!!!! wow good on you Kandee! But can you come to Australia one day???? We would love to have you here!!!!! Good luck with your tours!!! YAY! Ur coming to Chicago!!! YAY for Atlanta! I'm so there! Awuh I thought for sure you would be coming to Vegas :[ I wanted to see you so bad! I want to go so bad!!!! aww kandee!! come to san francisco! yeeeeeeeeehaw you're comin to texas!!! hello, you can add Phoenix to your list, right? 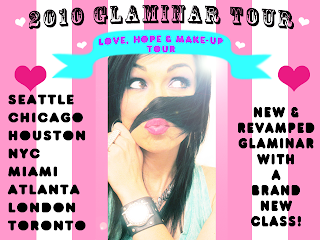 Kandee, I hope one day very soon, you will come to San Antonio or Austin, Texas!!! OMG YOUR COMING TO SEATTLE!!!!! YIPPY!!!!! I CANT WAIT!!!! IM SO THERE I DONT EVEN KNOW WHEN IT IS BUT IM SOOO THERE!!!!!! !IM SO GLAD YOUR COMING TO SEATTLE...WELL CAUSE I LIVE THERE LOL SORRY IM A LITTLE EXCITED!!!! LOVE YOU KANDEE CANT WAIT TO SEE WHEN YOUR COMING!!!!! Awesome! I really hope I can see you; hoping to see your details soon!! i'm so excited for CHICAGO!!! thank you so much for expanding your locations!!! I AM SO EXCITED YOU ARE COMING TO SEATTLE, WA. I CANNOT WAIT TO SEE YOU HERE! Kandeee!! your glaminar webpage won't load!!! I just saw your Glaminar website -- WOW! It looks fantastic! oh bummer, none in Australia. Idk which Glaminar I will be able to make but I'm gonna try & bring as many of my girlfriends as possible! I'm so excited - I can't even begin to express how happy you've made me by staying up all hours of the night & day to put this up! You are so wonderful...meeting you would be like ...OMW, just unbelievable! Kandee, please post the date for Houston! I live 7 hours away and I need to start saving!! I'm from the Netherlands and was saving money for the USA, but now I'm definately coming to LONDON!!!!!!! YEAH!!! people, it's london ontario if you see london is the only place outside of north-america, so why wouldnt she travel all the way across europe..? Thank you Kandee for coming to Seattle!!!! If there is anything I can help you with... I got connections DJ friend, photographer friend or I can be your Taxi if you need me to just ask (: I'm so excited!!!! London... very close...but maybe something closer... France or Germany... love! Cant wait to see the date for NYC!!! Im SO EXCITED! :) How do we sign up as soon as you post the date? Iam brazilian and I am in love with your makeup. I live in NYC and I will try to save money so I can go on GLAMINAR. How much are the classes?? love you so much !!!! I will come to the one in Chicago if the timing and my money are right!! i want to take the Hope Love and Dreams class Love Camp!!! I need it! =( VANCOUVER!!!!!!!!!!!! please come!! i really wanna go to your glaminars! Ahhh! You're comming to Miami. It's almost two hours away but I still plan on making the drive. How could I pass this up? Love you, and I wish you all the best. BUT OMG TORONTO! I will find a way! This is so exciting!!! Hey Kandee!! I'm super excited your coming to Houston!!!!!! you are my idol and a huge inspiration to me!! I was wondering if you were going to do scholarships for these set of glaminars? I'm a single mom so I have to start saving!! you're the sweetest!! Didn't see where I was to click to sign up for Seattle! Also do I have to attend the first class? I would love to be a mu artist but at this time I couldn't with where my life is at currently. Or if I don't plan on being a mu artist immediately should I not sign up at all? I am just so proud of you! I love your site and what you are ALL ABOUT!! I do not even wear makeup and love watching all your tutorials!! I actually love makeup, I just don't wear it. (My hubs isn't a fan so I just wear mascara and some gloss.) I just am so proud that you are able to go to so many cities to help those who want to do makeup. Praise the Lord!! !